Drag and drop conditions to create custom condition sets. A custom shortcode is created for each condition set you build. The post filter allows you to control all post content on your site. Override the global post filter for individual posts. 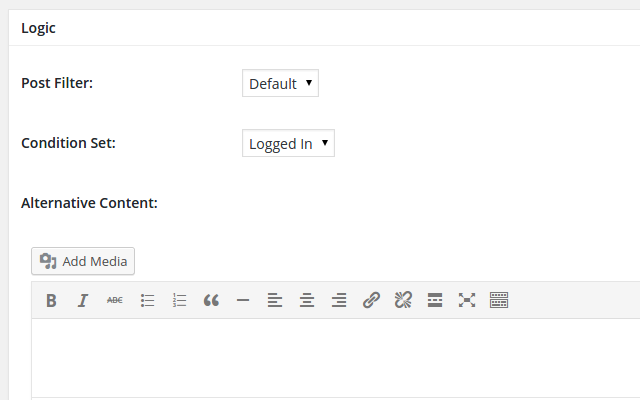 Logic is a flexible and powerful plugin that allows you to control who sees content on your WordPress site and under what conditions. 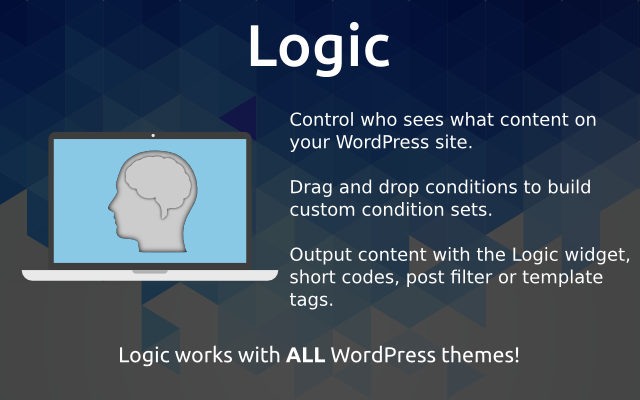 Logic works with ANY WordPress theme. Download Demo VersionThe demo version is fully functional but only the true and false conditions are available. From displaying a message to users who are logged in to checking whether a post has a specific term from a custom taxonomy Logic can do it all. The possibilities are endless. The custom Logic widget and shortcode make it simple for non-coders to display content based on complex sets of conditions. 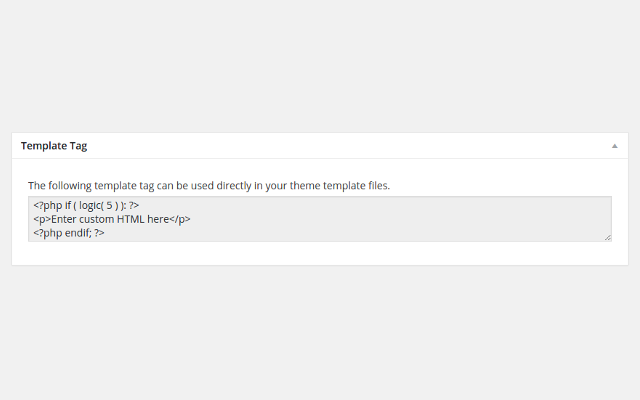 The template tag gives theme developers and coders complete control over where and when content is displayed. Shortcodes – Each condition set features it’s own unique shortcode. 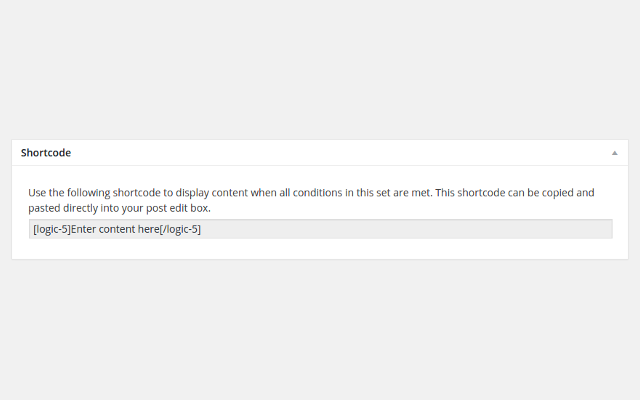 Copy and paste the shortcode into your post editor to display conditional content within posts. Widget – The Logic Widget allows you to quickly and easily conditionally display content in any widgetised area in your theme. 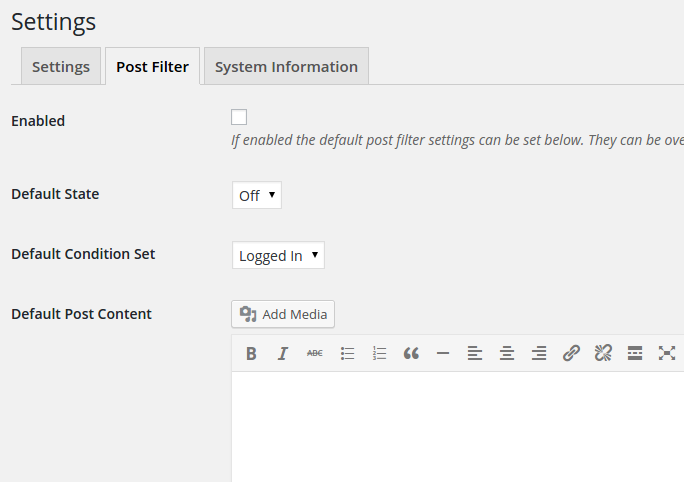 Post Filter – The post filter feature allows you to limit access to individual posts or on a site wide basis. Template Tags – For ultimate control use the built in template tag to display content directly from your theme template files. Just purchased Logic and love it, however a thought has struck me. I also notice you develop the Ad Injector plugin. Maybe this already exists, however, what I would ideally like is to be able to create ads in the same way listings are created, with GeoLocation details etc., effectively a stripped down clone of listings. This would be a separate Custom Post Type to the listings so would not show up in Archive Pages. These would then be displayed, for example in a widget based on condition sets. It would allow for highly targeted GeoLocation Based advertising amongst others. Would love to know your thoughts: or does it already exist? I’m glad you like the plugin. You can do what you describe already using the logic template tags. It would involve editing your theme files but you could use the following inside them: echo get_post_field(‘post_content’, $post_id); where $post_id is the id of the post you want to output. This would work for any post type. Apologies, however, what are and where do I find Logic Template Tags? Somehow I didn’t notice the inbuilt tutorials. I can see how I would create a Geo-Targeted ad, however would need to create each ad individually as Latitude and Longitude have to be specified. I could potentially have 1,000’s of ads and would be very time consuming to create a condition set for each and every one. What I would like, for example, is if site visitor is within range of ANY advertiser / listing owner who have already been Geo-Located when they created their listing, then their ad/business will be dynamically displayed. How would I achieve this with this plugin? PS Will do be setting up a support Forum for this plugin? The geolocation is experimental – read the plugin help file for the reasons why. For this reason it is disabled by default. You will need to enable geolocation in the plugin’s settings page (should be http://www.yoursite.com/wp-admin/admin.php?page=logic_options) to access the geolocation condition. Drop us an email if you have any other questions. I’d like to use this plugin to control the type of fields that users see based on subscription type. For example, I want “free” listings to show a limited number of form fields and and I’d like “paid” users to view unlimited/all form fields. 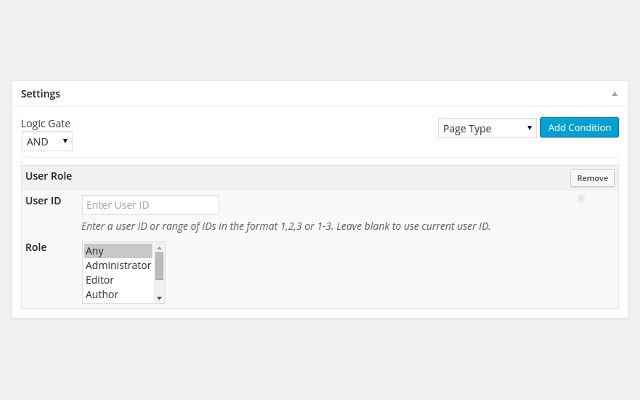 For example, free users can only list in one category but paid users can list in all or many categories. Free users can upload one picture but paid users can upload many pics. Will I be able to make subscription restrictions using this plugin? Can Logic plugin be used with Classipress? Hi, I’m very interested in using this plugin. 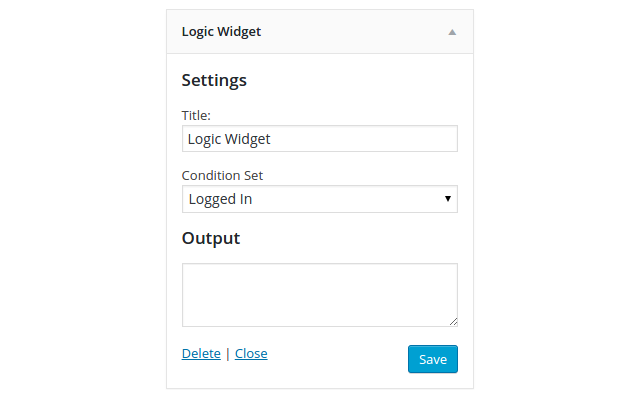 What is the difference between this plugin and your Logic Widgets plugin (https://marketplace.appthemes.com/plugins/logic-widgets/#desc)? Not quite I am understanding this plugin, but is this like having a search sidebar, and they can choose to filter ads using categories, or select menus, checkboxes etc? A live demo would be nice, but I am going to install into my demo site. Is the author still active on these forums..? I have had a mail from Yukimo saying the author is still active . Yes, our marketplace team have regular contact with the marketplace developers – recently, as there was a product review carried out. Thanks. So where is the developer…? I’m looking to add some kind of geolocation filter to jobroller. ie if an employer specifies that only applicants from the UK can apply for a job, then applicants from other countries are blocked. Can this plugin be used to perform this function? I wanted to check out the free version before purchasing, but it appears the link is now broken. Is there any chance for an updated link? Or is the plugin no longer supported?